GB1 – Fundamentals – This week’s focus for Self Defense covers clinches and holds on our feet in the offensive manner to either subdue the attacker with a submission or control the attacker for negotiation by taking the attacker to the ground. Week 8’s Sport BJJ will take your game from good to great by going from side control to mount for 4 points in competition, or ending the fight with a submission when you have control control. 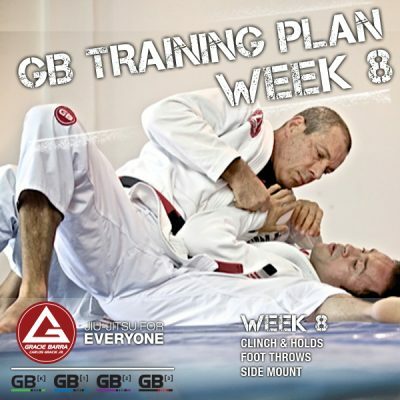 GB2 – Advanced – This week we learn some great options for foot throws in the Gracie Barra Advanced Curriculum. In addition, we learn how to use the lapel to our advantage from side mount position with great attacks and submissions. GBK – In our kids program we teach our students how to recover from a bear hug and take down his/her opponent, some good options to move from side control to mount and a great foot sweep from standing.